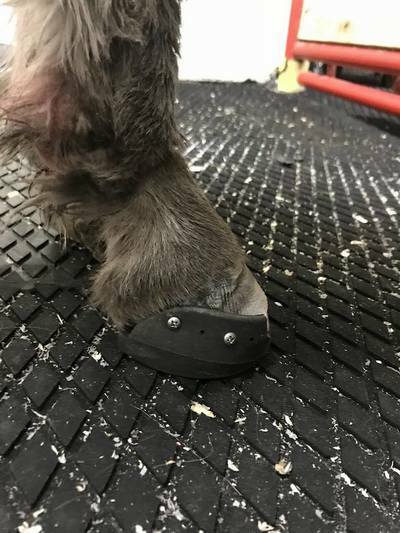 Ferguson Gets A New Hoof - Holyland Donkey Haven Inc.
Ferguson: Angela, the president of Holyland Donkey Haven received a call from a concerned person regarding Ferguson's welfare. Ferguson was originally rescued from a salvage yard and was severely neglected. His hoofs had not been trimmed and one hoof was grown into part of his leg. Ferguson was rescued by another party initially, but they were not able to properly care for him. Ferguson was underweight amongst multiple animals and trying to fend for himself. His hoof was not in proper condition and being cared for and Angela was able to convince the owners to let her take Ferguson. Ferguson was immediately sent to the UW Madison Large Animal Clinic for care. The clinic treated Ferguson and recommended treatments and healing for 1-2 years. Holyland Donkey Haven has religiously kept up with the routine care and medicine for Ferguson and now he gets his second chance at life! 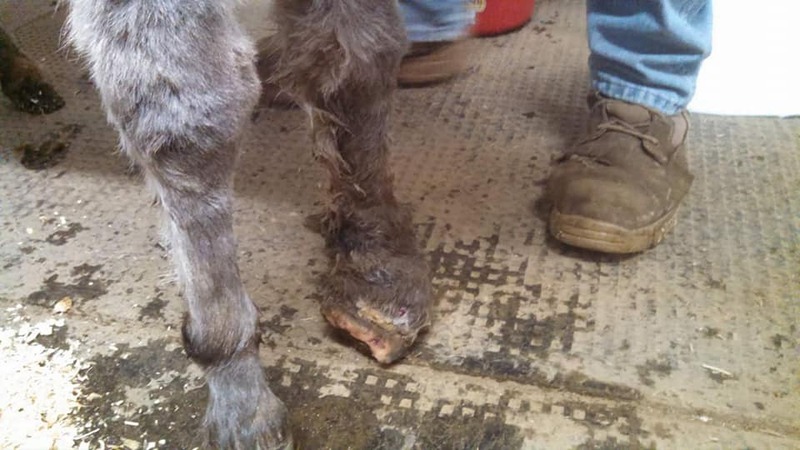 Ferguson returned to the UW Madison Large Animal Clinic in late March to be evaluated. 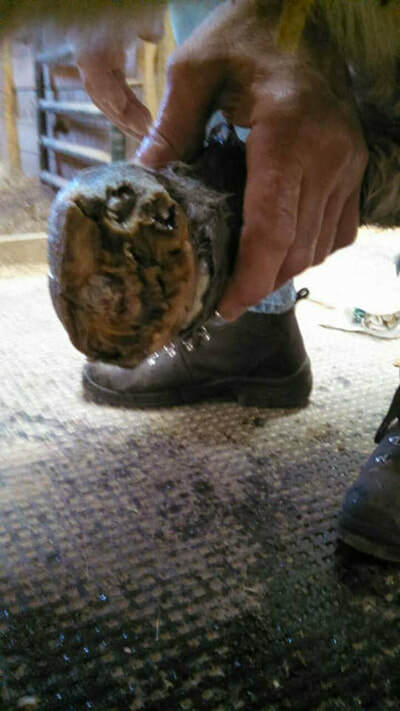 He was fitted for a right shoe and the team did more trimming of his left hoof. 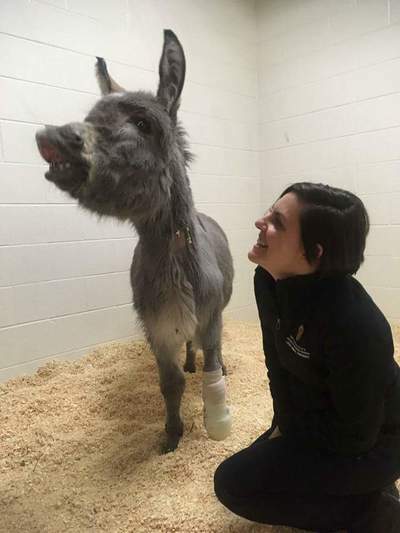 Ferguson healed at the clinic for about a week and was able to come home to Holyland Donkey Haven. Ferguson then returned to Madison for his amputation surgery on April 18th. The surgery was successful and Ferguson handled it like a champ! He is currently resting and healing at the UW Madison Large Animal Clinic in preparation for his surgery scheduled on May 23rd. He is loving all of the attention and uses those sweet eyes to beg for extra hay and treats! Ferguson will be staying at the UW longer than expected and will need physical therapy treatments after his prosthetic is placed. 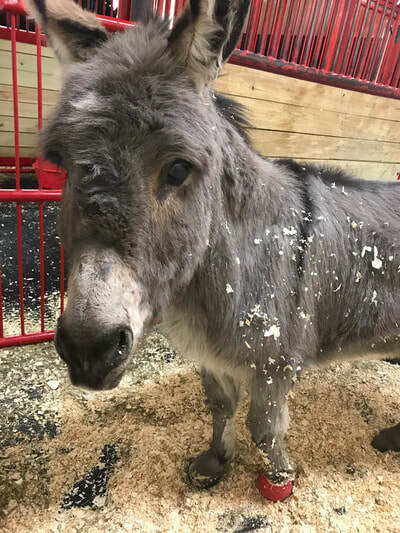 Please consider sponsoring Ferguson and help support his continued care! 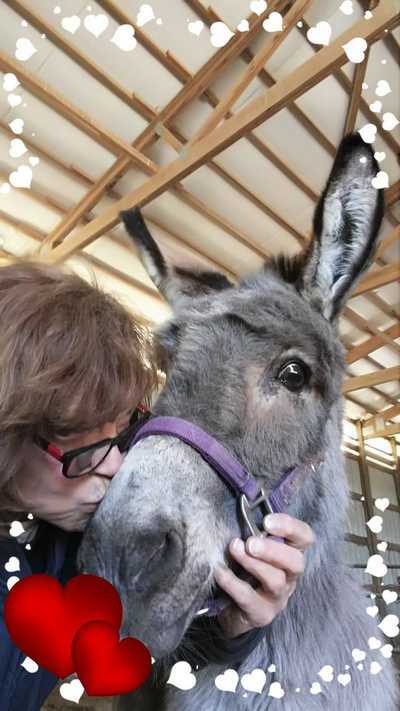 Holyland Donkey Haven operates strictly from donations and volunteer work.